The long-awaited arrival of the first brick and mortar location of Red Apron, a locally sourced whole animal butchery and small batch producer of handmade charcuterie, is officially in sight. 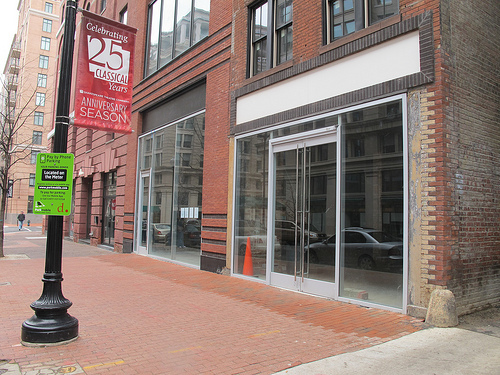 Red Apron is pleased to announce that in the fall of 2012 they will be opening a 3,600 square-foot shop at 709 D Street, NW in downtown Washington, D.C.
Celebrated Chef Nathan Anda conceived Red Apron in 2008, and over the past three years, Red Apron has grown into one of the D.C. area’s premier butcheries and producers of handmade charcuterie. With the resourcefulness of an old world butcher and the creativity of a trained chef, Nate has created an expansive pantry of both classic and original products, all of which will be available at the Red Apron shop when it opens in Washington’s vibrant Penn Quarter neighborhood. Red Apron will offer nearly 80 different products, all made with meats that have been responsibly raised and carefully sourced from local farmers. Red Apron’s pantry will include raw cuts, roasts, traditional and original salumi, pates and rillettes, smoked meats, sausages and hot dogs, prepared foods, and provisions such as sauces and stocks. In addition to a well stocked butcher case, the shop will also be open for lunchtime business, offering a rotating menu that will allow Anda to apply his creativity in the kitchen to his wide array of products. Menu items will undoubtedly include hand-crafted hot dogs, sausages, and sandwiches that will highlight Red Apron’s delicious cured products. The space on D Street that will be Red Apron’s home was once the Union Hardware Building, and it has recently been beautifully restored by Douglas Development, the current owner. The historic bones of the space include exposed red brick walls, light-filled windows and an open layout, making it the perfect fit for Red Apron. Chef Nate Anda brings a combination of classic training, immersion in the craft of charcuterie, and commitment to butchery traditions to Red Apron. Anda first started cooking under Chef Angelo Vangelopoulos at the Ivy Inn in Charlottesville. There and at New England Culinary Institute in Montpelier, Nate learned about the craft of charcuterie. After graduation, Nate returned to the Washington, D.C. area and worked at the kitchen in Equinox for two years before being tapped to help open Salamander Market. In 2004, Nate was chosen to become the executive chef of Tallula and the adjoining gastropub EatBar, which opened three years later. At Tallula and EatBar Nate quickly built an expansive charcuterie program, sourcing whole animals and butchering them at the restaurant. In 2008, with the support of Michael Babin of the Neighborhood Restaurant Group, Anda founded Red Apron Butchery. Chef Nathan Anda conceived Red Apron as a locally sourced, whole animal butchery and producer of handmade charcuterie. With the resourcefulness of an old world butcher and the creativity of a trained chef, he has created an expansive list of both classic and original products. Anda sources pigs and cows from local farms that raise their animals responsibly, and he chooses the right breed and feed for each product. Red Apron is proud to support small, local farms that follow sustainable practices and to promote whole animal butchery and utilization. For more information and a full list of products please visit www.redapronbutchery.com. Anyone Try the Bacon Wrapped Hot Dogs at St. Arnold’s Underground?